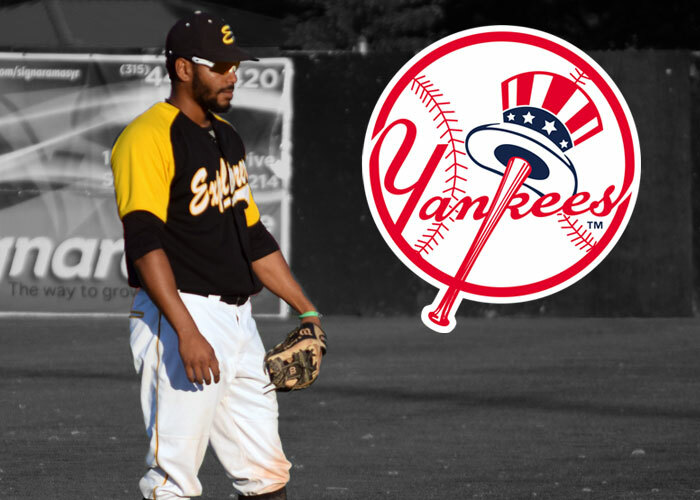 TAMPA, FL – Nate Coronado, who played for the entire season for the 2016 Empire League Champions Sullivan Explorers, has officially signed with the New York Yankees. Nate, one of the top prospects of the Empire League in 2016, played shortstop, third base for the Explorers. He led the team with a .381 batting average in 126 At Bats hitting 4 home runs while driving in 27 runs and scoring 35 times. He also led the team in stolen bases with 13. Coronado went on to sign with the Colorado Rockies for the 2017 season after the 2016 Empire League season in which he was sent to the Rookie ball level in the Pioneer League team called Grand Junction Rockies. In the only 20 At Bats he had during his time with the Rockies he had 9 total hits, 3 of them Home Runs, which is 1 home run every 6.67 at bats, .450 batting average, 1 triple and 7 RBI’s and stolen base. Numbers that are beyond Rookie level. Well, Coronado was released after putting up those numbers. Coronado went on to finish 2017 with a .333 batting average in the highest level of independent baseball (Atlantic League). In 60 games, he had 69 Hits in 205 At bats, 13 doubles, 2 triples and 6 Home Runs with the Landcaster Barnstormers. He had 38 RBI’s and 16 stolen bases. Coronado had proved once again he is a top prospect in minor league baseball and the New York Yankees signed Coronado for the 2018 season. Nate will report to Tampa, Florida where the New York Yankees spring training complex is located as he awaits assignment to a team.